On the downside, do I have fat feet? My Margiela jacket is finally here!!!!!!!!!!!!!!!!! It's lovely, although I find the construction to be a bit flimsy. Still, what a steal! And of course it's raining today, so I can't wear it. Booooo!!! ^ The suede one? Didn't you buy that like a year ago...? [:D] Anyway, congrats! [quote user="droogist"]^ The suede one? Didn't you buy that like a year ago...? [:D] Anyway, congrats! Yep. It was sitting in my neighbors apt. for three days while I was tearing my hair out. But now I have it - it rocks! Thanks. After an extensive boot hunt, I finally picked up a pair of high Miu Miu pull-ups in a distressed leather with a round toe. Not cheap, but not too bad either. Might need a pair of cropped pants to go with them! Sounds good - do you have any pictres? How do you find Miu Miu quality-wise? They're not bad, actually. And despite the Prada parent, I like Miu Miu's image. I think I must own like 7 pairs of Miu Miu shoes from various seasons, one pair in particular that I have not stopped using for over 5 years and they're still gernering me compliments, as well as holding up really well. The boots are actually a great basic, very nondescript except for the boot height (which is pretty high). I'll try and take pics. At $695, they're not cheap, but not as high as other boots out there. I reckon Miu Miu quality is really good for the reasonable prices. Sometimes there are loose stitches, buttons etc but those can easily be sorted and they use interesting, quality fabrics, which is much more important. I am wearing a pair of slick woolen trousers today that I bought 4 years ago and are still going very strongly. 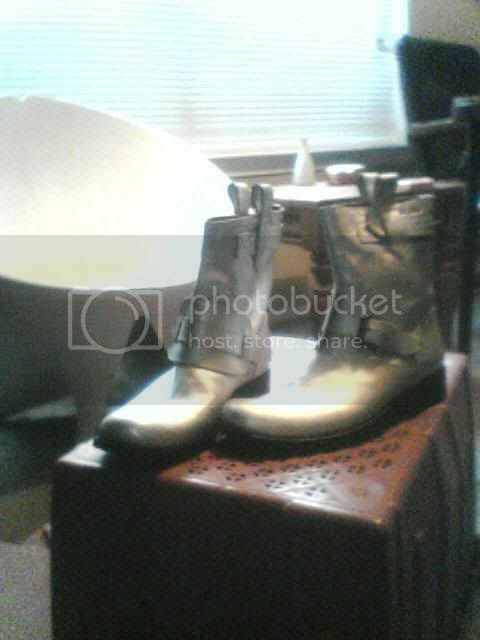 threerepute, it's hard to see the first pair of boots from that picture. the boots on the bottom are not bad, but they look a little uncomfortable as far as opening/closing them. So, it got cold outside, and I while scrambling for accessories, I realized that I don't have a black hat, which is of course a crime in my book. 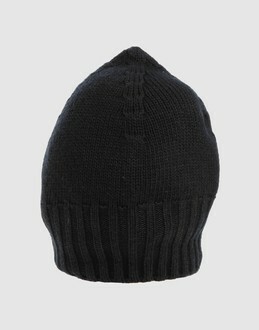 I bought this one from Yoox, should be fine for $40 (100% wool). Ahem, so I went to buy winter boots for my daughter and ended up with a pair of pants for myself.... Oops. I'm a bad father! Well, not really, since there weren't any good boots in her size. I HAD to compensate! Anyway, the pants are by a little know brand (outside of Italy) called Messagerie. They do some funky stuff. These pants are grey in color done in my favorite fabric combination 95% wool, 5% steel, so the legs have a crinkley effect. 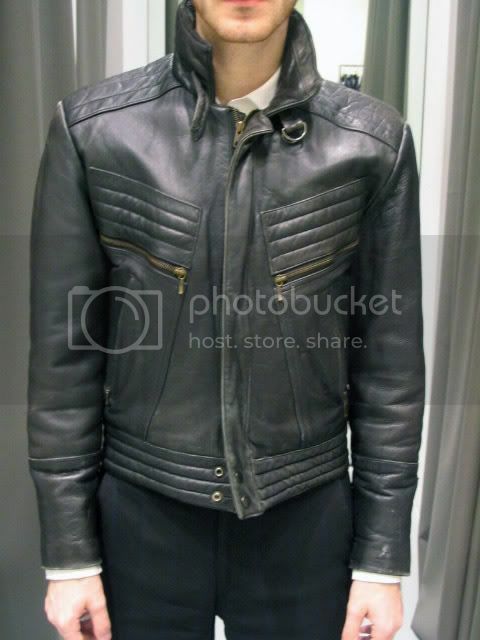 They also have some nice hardware, very subtle tabs on the sides, and studs near the pockets. Fully lined, too - you don't see that often these days. $37 - Daffy's is full of garbage, but sometimes they have some crazy finds (and good for children!!!). Oh, and I got my new cell phone/mp3player/watch. cute phone! i'll be curious to hear how you like it, as I am in the market for a new one as well. very devoted of you to brave daffy's--glad to hear it was fruitful. that store gives me a headache, but it can be good for those obscure italian labels. the pants sound very good! Yea, I never go in there for myself, only when Mrs. Faust asks me to look for something for baby Faust. It gives me headaches too (so does Century21 - that's why I go before work, when it's EMPTY). I'll let you know how the phone works out once I have it for a week or so. Oh, these are the boots. Crappy photo though. I like that it's mid-way between the refinement of a Gucci/YSL versus the opposite spectrum deconstructivism of a Carpe Diem or Margiela. While the boot shape is lean and clean, the toe is quite round and the leather looks like a distressed horsehide. Like a horse, the damn thing needs to be broken in though. Anyway I still like it. I like the shape of the boots, bakla, these can last you a long time without going out of style.